If you’ve been feeling down, rest assured that it’s completely normal to go through highs and lows throughout your life. Sometimes life can be a breeze, and other times it can feel like the world is betting against you. If you’re feeling down and want to know how to be happy with yourself, you’ve made the first step. Recognizing that you know you’re not feeling your best is a healthy realization. One of the most important things you can do in life is find happiness within yourself and truly learn how to be content. If you need some help in this area, read on for some amazing tips to try! If you want to be a happy person, you have to do what happy people do. Here are 7 habits of happy people to start implementing in your life. Meditation can be a total life-changer. Meditation urges you to slow down and experience the benefits of mindfulness, and when practiced consistently, it can relieve anxiety, increase focus, and boost your self esteem, making you happier all around. It can be hard to find silence in your hectic day-to-day, but if you carve out time to meditate, you’ll notice all types of positive differences in your life. Focusing on being grateful for what you do have, rather than what you don’t, is a foolproof way to feel happier on a daily basis. Happy people make the most of what they have and don’t take anything for granted. When you practice gratitude, you’re more likely to experience improved mood and energy, so take time to write in a gratitude journal everyday and express your thankfulness to your loved ones. One of my favourite quotes is: “You’re the average of the 5 people you spend the most time with.” Happy people don’t spend their time with negative, think-the-world-is-against-them, pessimistic people. They hang out with people who are happy and supportive, who build their self-confidence and push them to their fullest potential. Happy people are kind and respectful towards others. They treat others how they want to be treated and understand that kindness is contagious. We’re often kinder to others than we are ourselves, so without respect and kindness for others, it can be hard to find self love as well. If you’re wondering how to feel happier, one of the most important things you can do is take care of yourself physically and mentally. Get proper sleep every night, fill your body with healthy, whole foods, work out regularly, detox from screens, and drink lots of water. You need to take care of yourself to do and feel your best. If you want to be happy, self-confidence is key. Confidence allows you to do what makes you happy, and gives you the ability to say “yes” and “no” when you want to. It gives you the ability to stand up for yourself, as well as aim high and take on a new idea when it hits you! Confident people aren’t scared to say how they feel, and they believe in their skills, goals and ability to succeed. Here are 5 ways to be more confident with yourself. 1. Step outside your comfort zone daily, no matter how small the feat. Get yourself used to feeling uncomfortable and knowing it will be okay when you do. 2. Find a mentor who can help you get to where you want to go in life. Learn as much as you can from them and put their advice into action! 3. Keep learning. The more you know, the more confident you will be. The second you stop learning is the second you start declining, so make it a point to consistently educate yourself. 4. Breathe! Always remember to breathe. So often we take breathing for granted, but we need to remember to slow down and breathe deeply. This reminds you that you’re in control of your body and aren’t dominated by your unconscious mind. 5. Be prepared. Are you gearing up to give a big speech or presentation at work or school? Practice it numerous times. Are you going for an interview? Get someone to grill you with interview questions and read about the company online. The more prepared you are, the more confident you’ll be! Your relationships, whether it’s your marriage or the bond you share with your best friend, can take a toll on how you feel on a daily basis. Check out these tips on how to be content in your relationships. 1. Love yourself first. You can’t be happy in any relationship until you are truly happy with and love yourself. 2. Be realistic in your expectations. Sometimes we expect too much from the people who love us most. Accept that everyone is human and be practical when it comes to what you expect in your relationships. 3. Always practice kindness. The people who you have relationships with should have your full kindness. Think about their feelings before criticizing them, really listen to them when they’re speaking and ask yourself if it’s worth it before getting angry or frustrated. 4. Let go of jealousy. Jealousy is the thief of joy. If your significant other is giving you reasons to be jealous because they’re flirting with other women, then you should be re-evaluating your relationship all together. However, if the jealousy is coming from your own insecurities, you’ll be much happier once you let it go. Need a little extra inspiration? Here are 15 self-love quotes to help you love and embrace yourself. If you’re not as happy as you know you could be right now, try some of these tips to get back to your happy self! 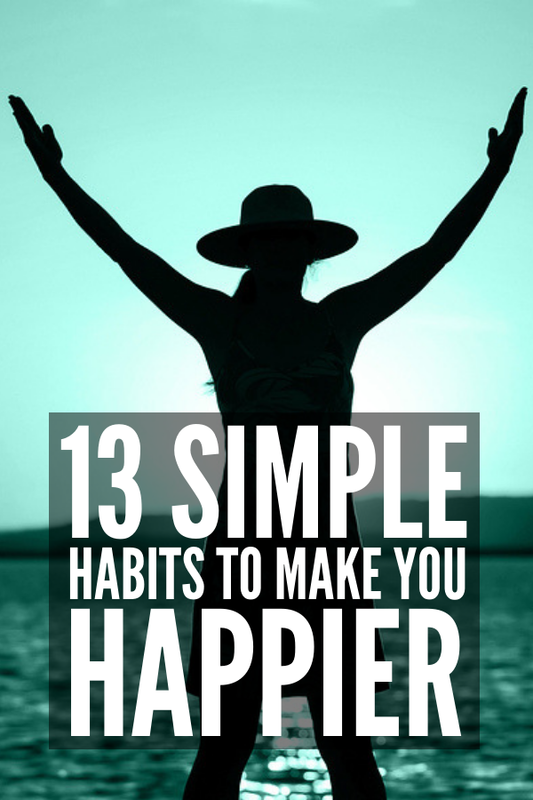 If you loved these tips on how to be happy with yourself, make sure to share this post on Pinterest! And if you want more self-love tips and tricks, follow our Health Board on Pinterest!